Have your family thinking you’re a professional by preparing these homemade gnocchi. It is not timely and really tastes yummy. Gnocchi with a bit of a twist. Enjoy!! 1. Melt butter in a heavy based saucepan, add onion and garlic and cook until softened. Add tomato sauce and cook for 10 minutes, stirring occasionally, until slightly thickened. Season to taste. 2. Meanwhile, grate half the Parmesan with The Perfect Grater* and combine with cooled mashed potato, ricotta, eggs, herbs and seasonings. Knead in enough flour to obtain a smooth, non sticky dough (amount will vary, depending on the dryness of potatoes). 3. Divide dough into 4 equal portions and roll each into a long sausage shape 2cm thick. Cut into 2cm lengths. If desired, gently roll each gnocchi over the back of a fork. 4. Bring a large saucepan of salted water to the boil and cook gnocchi in batches until they rise to the surface. Toss immediately with hot sauce, asparagus and basil leaves. Serve with remaining shaved or grated Parmesan and a drizzle of olive oil. This entry was posted on July 24, 2010 at 7:30 am and is filed under Cooking, Family, Friends, People, Random, Recipe. You can follow any responses to this entry through the RSS 2.0 feed. You can leave a response, or trackback from your own site. This one looks delicious, too. I love dishes with tomato sauce. Okay, now it’s Stazzichini and Gnocchi for Sunday dinner! 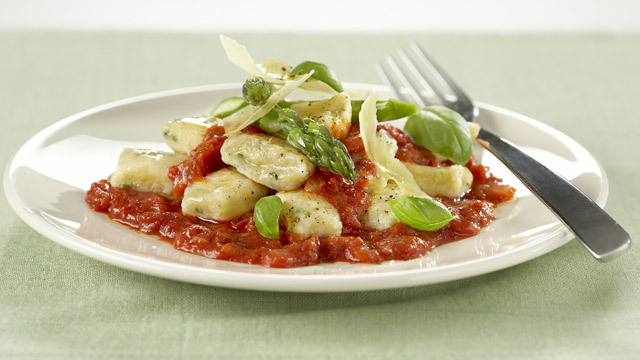 I love gnocchi and can’t wait to try your version…it looks so yummy! This looks like a winner – thanks once again for your culinary inspirations! Ai dit lyk baie lekker, en ek is juis besig met ‘n pos oor aspersies! Delicious! This is making me hungry time to cook! Oh, yum! Love gnocci. Love asparagus. There’s no hope for this extra-wide waist. Okay . . . portion control. That’s the answer . . . easier said than done . . . inspired recipe . . . Thanks, Sweetie! Wow…never tried it like this before…pumpkin and spinach with walnut butter sauce wowowowo…got to try it girlfriend! !